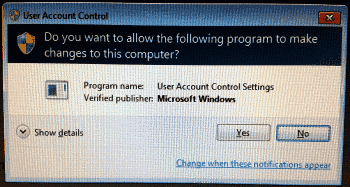 User Account Control is a feature in Microsoft Windows 10, 8, and 7 that warns users with a dialog whenever a program tries to make changes to the system. The dialog will ask “Do you want to allow the following program to make changes to this computer?“, then provide details about the program name and publisher along with a selection to choose Yes or No. For many users, this feature is just an annoyance. 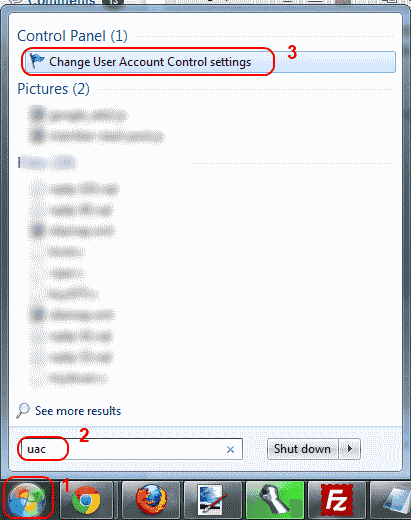 You can enable or disable UAC using these steps. Select the “Start” button, then type “User Control“. An option should appear that says “Change User Account Control settings“. Select that option. Always notify me when – Programs try to install software or make changes to my computer and when I make changes to Windows settings. 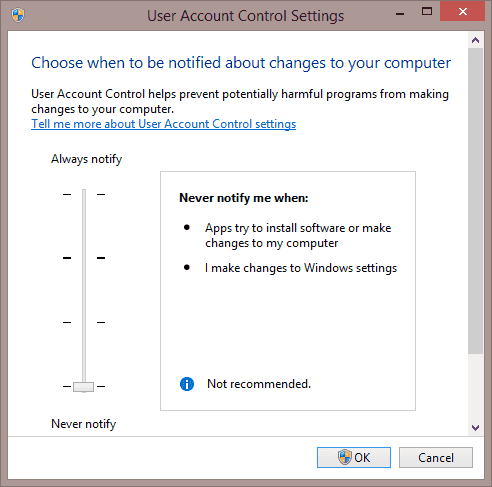 Notify me only when programs try to make changes to my computer – Don’t notify me when I make changes to Windows settings. 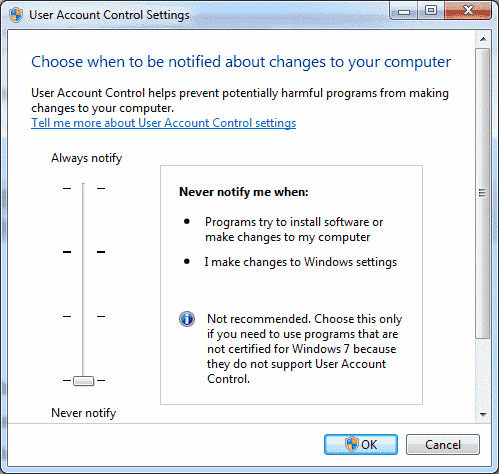 Notify me only when programs try to make changes to my computer (do not dim my desktop) – Don’t notify me when I make changes to Windows settings. Never notify me when – Programs try to install software or make changes to my computer and when I make changes to Windows settings. Hold the Windows Key down and press “R” to bring up the “Run” dialog. Type “msconfig“. An option for “System Configuration” should appear. Select it. Select “Change UAC Settings“, then select the “Launch” button. You can choose one of four levels. The bottom option completely disables UAC. Click the “Start” orb, then type “UAC” in the Start Search box. The result of “Change User Account Control settings” should appear at the top of the area. Select it. Click “Yes” if a dialog appears. Choose a selection, then select “OK“, and your UAC setting is set. Posts identified my problem – unable to Type YES in greyed box when asked if I want to make changes …”. Unfortunately no answers given as how to resolve this problem. I am having the same problem with “do you want to allow………”. This has just recently started showing up on my PC. Mine asks “do you want to allow Google app to make changes…….” I do not have a Google app, I only use Google search and Gmail. I have Windows 10 Creators Update. Could this be another problem caused by the Creators Update? Thanks for the reply. I have tried your instructions but still the same results. ” Do you want to allow this app ………….etc ” with only the no button option. It is happening with all I try to launch. Tried all the tips I can find with zero results. Try to run apps/mscconfig/command prompt admin etc. I always get the message ” Do you want to allow this app to make changes to your device ” In the pane the is only one choice ” NO ” A window will flash up and disappear. I have changed the UAC, NEVER NOTIFY to ON (other than NEVER NOTIFY) and the computer has been requested to RESTART. After RESTART, UAC setting has been changed back to the NEVER NOTIFY. Why?